Toyman is one of Superman’s longest serving villains. But what’s he good for? 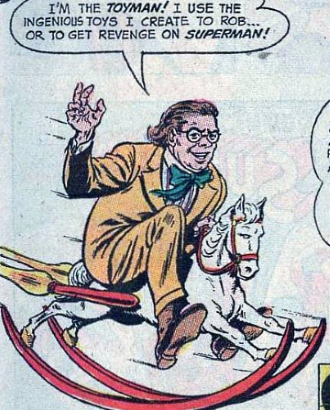 Of course, Toyman is an archetypal supervillain. He’s the kind of criminal who has a specific theme (toys) and uses them for all manner of crimes, be it robbing banks or breaking out of prison or just straight up seeking to “show them all!” He’s ideal for appearances where he’s not the main threat, but just to add a bit of action. He’s a good cameo character. You want to start the story with a fight scene that isn’t tied to the main plot? Have Superman foiling a giant cymbal monkey sent by Toyman. Or have him capturing Toyman’s radio-controlled submarine that is smuggling stolen gold. Or have him burning up the paper stealth bombers that Toyman had sent to attack city hall. The options are endless. 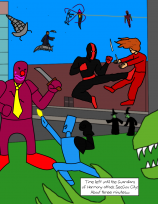 But can you build actual plots about a colourful criminal while staying true to my insistence that all the characters should represent something appropriate to Superman missions? Well, obviously, if you’re starting with Truth and Justice you don’t even need to go further. Criminals are threats to Justice. But criminals aren’t just a threat to others, but to everyone else. Over the years, Toyman has been depicted as mostly-harmless old fool who can be easily reformed and live a life of goodness and as a ruthless remorseless killer who could never be reformed. I’d want that pendulum to stop somewhere in the middle. Let’s have a Toyman whose arc is about determining if criminals can and should be welcomed back into society, and if they’d want to. Worth noting: On the currently-running Supergirl show, Toyman’s son Winn is a character and has to deal with the fact his father was a crazy supervillain. That’s good. Let’s keep that up. Also, he’s often been depicted as a friend and partner of the Prankster. Supervillain friendships are great, so let’s have more of that as well.